Transform tiny objects into art...because small is tremendous! Do you have a special object, small piece of art or family memento you'd like to display? 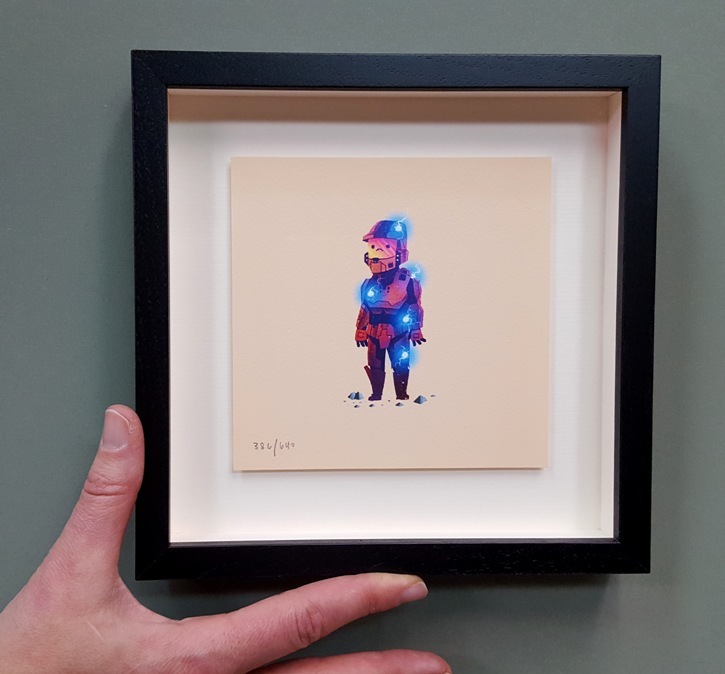 Mounting and framing transforms tiny things into objects of significance. A shadowbox, cove mat, or stacked frame can enlarge the setting of your treasure and make it into a conversation piece. Rest assured your tiny treasure will be well-protected when framed and displayed. Items that are fragile or may fade can be preserved with Conservation or Museum Glass so that they last for years to come! We can help you scale the frame to show well on your wall, or frame a collection of items to hang together. We love the charm of these "tiny projects.” Because small is...tremendous! This wonderful painting from India is less than 4” across. We cut a circle mat to give dramatic focus on the art, while leaving a border that shows the recycled paper it was painted on. This charming gift was created by mounting the mezuzah on a cream mat inside a raised window. A deep frame was chosed to accomodate the object and make a dramatic depth. Silver tones and the deep blue create a sophisticated aesthetic. This special pin needed a display that allowed viewing from both sides. We used a wide natural linen mat and deep wood frame to accommodate the pin, which was suspended with clear mono-filament. Museum glass on both sides protects and displays with minimal glare. 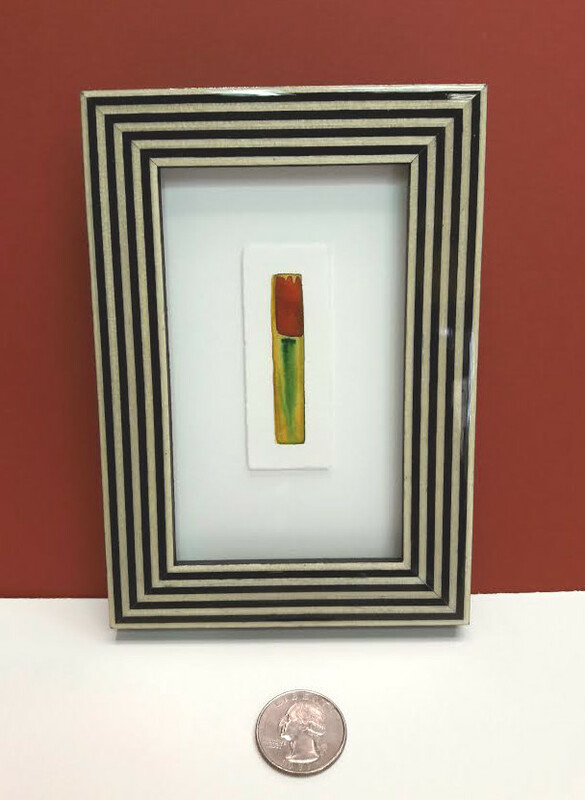 At less than an inch wide, this tiny painting deserved an eye-catching setting! We float mounted it on a white archival mat and added spacer inside the frame for dimension. Inlaid wood moldings are an Italian specialty, and the lacquer finish adds polish! A group of small prints by a contemporary artist were framed to hang in a grid. Each piece was float-mounted inside a black modern frame with Museum Glass and a shadowbox for dimension. 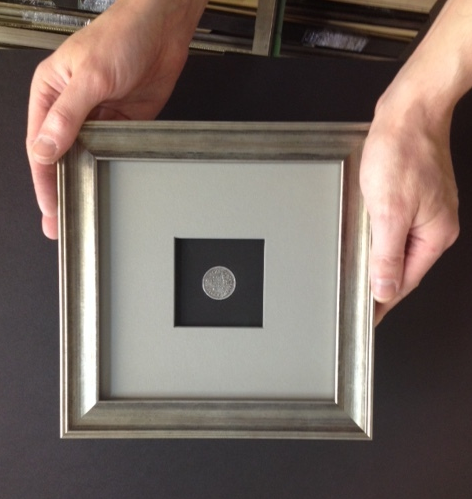 This special coin was custom-mounted in a black mat with a tiny circle cut in the center. The grey mat surround adds volume to the design and it is raised to create a dramatic window. The back of the coin can also be viewed through plexiglas on the back. 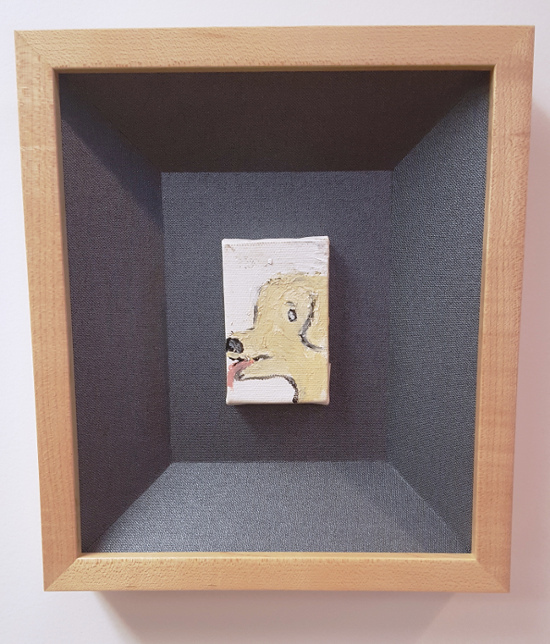 This little painting is about the size of a matchbox. We put it in a larger setting using a "cove" cut mate to create dramatic depth. The maple frame complements the warm tones of the dog and adds a natural feel. No glass is needed for this design. 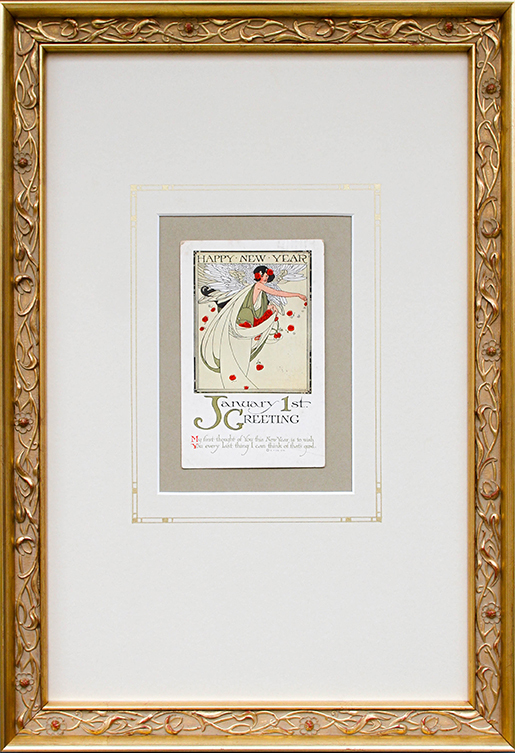 This 19th C card was framed in an ornate 14K gold frame with a floral pattern to match the Art Nouveau period. Wide matting with a drop bottom and deep top create an elegant proportion. The mat has a hand-drawn french line accent with geometric details. All framing elements are conservation quality and Museum Glass completes the look. Frame It Just for Fun!